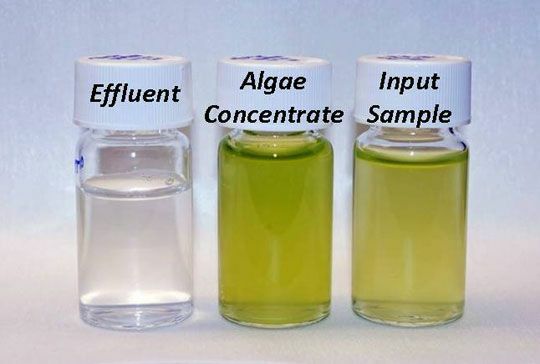 A technology for water purification and toner cartridges could cut the onerous cost of getting algae out of water. It started as a way to purify water, but the Palo Alto Research Center (PARC) believes that its spiral technology could solve one of the most vexing problems with making algae fuel a reality. A set of spirals – essentially channels that get water to swirl in a way that mimics how it flows down drains, discharge flumes and log rides – can potentially be used to separate algae from water with very little external energy. Much of the energy, in fact, comes from the force of the moving water itself. "We are able to recover 95 percent of the algae with very little energy," said Meng Lean, the principal scientist on the project. 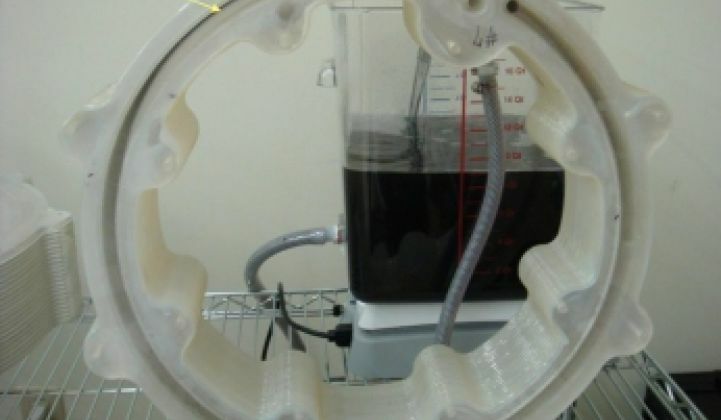 PARC has built a prototype that can cycle 1,000 liters of fluid a minute and is now seeking a grant in conjunction with a major oil company from the Department of Energy to experiment with it on a larger scale. In the picture, a water-algae mix enters at the 1 o'clock position. By the time it gets to 12, the algae forms a distinct band. A channel is a complete circle and the plastic housing holds an array of parallel channels. If it works on a large scale, scientifically calibrated swirling could become one of the more notable advances in algae in the past few years. Separating the algae from water sounds easy, but it's time-consuming and energy intensive. A liter of algae-infused water can be bright green, but it might only contain one to three grams of usable algae. To separate algae now, companies employ drying (which can gobble up 2 percent to 10 percent of the cost of producing fuel) centrifuges (4 percent to 14 percent) or filtration membranes (which get fouled). "De-watering is a huge challenge. It is probably the single biggest challenge remaining in terms of economics," said Michael Melnick, a visiting scholar at UC San Diego and the CEO of Biolight Harvesting, an algae fuel company in a separate interview recently. De-Watering, in fact, was one of the early challenges identified in the Aquatic Species Program when it started in 1978, according to John Sheehan, who ran the program in the 1990s. The program became the source of the algae movement. One of the reasons companies Solazyme, one of the leaders in algae fuel, moved away from growing algae in ponds and toward fermenting algae in kettles revolved around water management. Still, the vast majority of algae companies want to grow their microbes in water. PARC's research seems destined to draw other companies into this space as well. Sweden's Watreco has created vortex purifiers that can eliminate biological impurities, solids and even gas bubbles from water. An ice rink in Sweden employs Watreco's purifiers to take dissolved air out of its ice to make it harder. Some of the original work around the power of swirling comes from Viktor Schauberger, a somewhat eccentric Austrian forest ranger who worked in the first half of the 20th century, according to Watreco CTO Curt Hallberg. While Parc's spirals are planar, Watreco's vortexes are like sea shells with water accelerating through ever-tightening coils. Epuramat, meanwhile, says it uses gravity and movement to clean water. So how does PARC's device work? Water flows into the channel and, as the speed increases, algae cells (and impurities in the water) concentrate in a beam that can then be sucked out with a vacuum. While the centrifugal force of the water going through the spiral creates the environment for the beam to form, it doesn't technically form the beam. Instead, the transverse currents, those overlapping streams you see in water as it pours, are responsible for the tight, manageable particle beam. The level of centrifugal force, in fact, is quite low, Lean said, thousands of times lower than what algae and water might experience in a mechanical centrifuge. That saves energy, but also makes separation easier. Algae are neutrally buoyant. Spinning it faster therefore doesn't separate it and the water into distinct bands. Instead, it blends them. "We use the sweeping motion of the flow. It is the transverse flow pattern" that separates the algae, Lean said. "The way we use the cyclone is counterintuitive." PARC, which spun out of Xerox and earns revenue from licensing and royalties, first started showing off its spiral in 2008 as an experimental water purification device. The mathematics behind the device come from earlier research conducted for Xerox on how toner powder moves in waves when ejected above a charged surface. In other words, the ol' toner-to-water-to-gas tank path toward commercialization. The words say it all. Algae infused water goes in, and after a ride on the spiral you get concentrated algae and water.